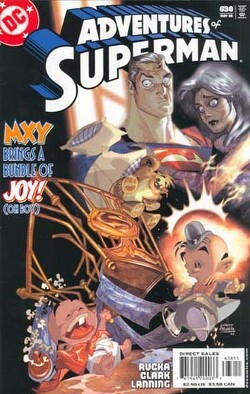 As Smallville Mxy tries to force himself on Chloe, he is suddenly hit over the head with a bottle of Cutty Sark by Perry White, followed by super-speed rabbit punches to the kidneys by Bart Allen, for screwing up a Smallville tradition of guest characters from the DCU being portrayed in a fairly well done, if not completely faithful, light. "And you tell Lucy Lane we're looking for her, too" Perry White slurs, just before Krypto/Shelby bites Mxy on the ankle. Chloe: Hold on Mxy! You will have to put on a bowtie before getting to second base. Mxyzptlk's hatred for Wheel of Fortune boils over when chloe asks him him if he would like to buy a vowel for his name. Chloe: Whoa there, I only make it with 10 year old boys in bowties. Superman: Yeesh. Next, you'll be telling me that Perry White's really Skeletor. With Mxy's degeneration from all-powerful extradimensional pseduo-god to annoying Eurotrash pretty boy/former West Wing castmember, Smallville's desecration of the Superman legend reaches a new level. Chloe: Wait, wait...Neal was Rebecca Cyrus all along? Superman: Mix, we ask you where this baby comes from and all you can say is 'you got served?' Louis:What's that smell? Mix:I've made his poop smell like Old Spice Red Zone. Superman (rolling eyes) Somebody saaaaaaaaave meeeeee! Smallville Mxy: First you vill give me a keess. Then you vill help me keel Moose and Squirrel. I'm glad the two never became an item. Because an 8:50 Chloxyzptlk would just be a pain to spell all the time. Sorry, Mxy, but once you've had Jimmy, there's no going back. (Pic 2) Chloe: No, no, you've got it all wrong. I'm not the stalker magnet around here. You want the dark-haired one that scrunches up her nose a lot. You guys are so incompetent, I can't believe you posted the picture side ways. Chloe is clearly bench pressing Mxy. Chloe: Mikhail, what is that smell? I really like it. Mxy: Why it is my Axe body spray. [CyberV enters the room and hits Mxy with a huge stick.] CyberV: What did I say about non-official Smallville promotions? Chloe: Waitaminute... You mean Neal actually ISN'T going to change his last name to be "Beforezod"? I tried, but the stupid government said something about already being on the thin line of extradition, and the last thing I need being an alias. Or something. I don't care. I'm going to liquidate them all. To give you an idea of how bad my name is now, my middle name is Robert. Guess mom though it's be a great joke to have a kid named Neal Bob. Why is that funny? Ask the neighborhood kid. I might have gone too far already. Lord knows I didn't get the joke when I was 8 and adults started pointing it out to me. Beforezod is MUCH better. Mxy: You lived with Lana, right? Chloe: Yeah, so? Mxy: Is is true that Lana has Hello Kitty sheets? The kind with the folded arms. Mxy: *whispering in Chloe's ear* Lex bathes in anti-freeze. Pass it on.